I buy the big bag of organic Lentils at Costco and buy organic for the veggies I use in this soup. I can already hear the questions, no I don’t think all of our veggies need to be organic. 🙂 For a great resource on buying organic veggies/fruit Google Dirty Dozen. Add the remaining ingredients except for Kale. Make sure to drain & rinse the lentils before adding them to the pot. Cook to a boil. 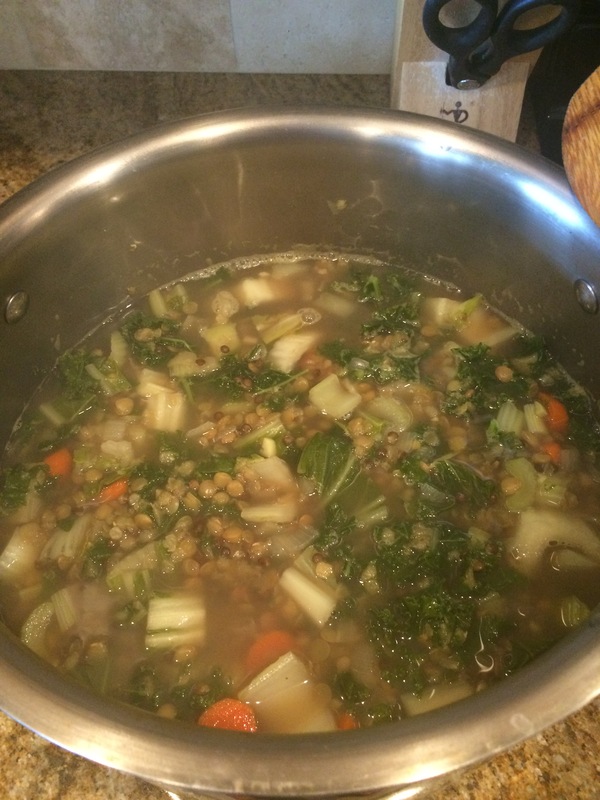 Reduce to simmer add Kale and cook for about 10 minutes or until Lentils are soft. You can modify and add different veggies of your liking as well. Sometimes I add more…you will see in the picture I added bok choy, it just happened to be in our refrigerator.